Mofjeld, H.O., A.J. Venturato, V.V. Titov, F.I. 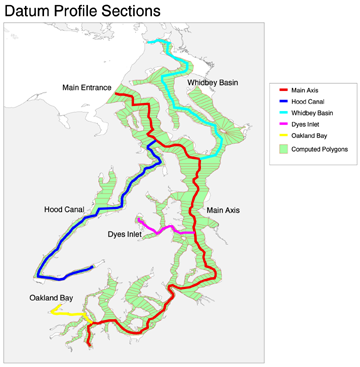 Gonzalez, and J.C. Newman (2002): Tidal datum distributions in Puget Sound, Washington, based on a tidal model. NOAA Tech. Memo. OAR PMEL-122, 35 pp. There is no plan to update the data on this site at this time. Data are provided in ESRI ArcGIS shapefile or ascii text format. Metadata associated with each file provide more details on the data sources, development procedures, and projection information. The data were compiled in ESRI ArcView 3.2. This project was partially funded by the National Tsunami Hazard Mitigation Program to develop tsunami inundation maps for at-risk U.S. coastal communities. The development of these data were also partially supported by the Joint Institute for the Study of the Atmosphere and Ocean (JISAO) under NOAA Cooperative Agreement NA67RJO155, JISAO Contribution No. 959, PMEL Contribution No. 2533. Mofjeld, H.O., A.J. Venturato, F.I. Gonzalez, V.V. Titov, and J.C. Newman (2004): The Harmonic Constant Datum Method: Options for Overcoming Datum Discontinuities at Mixed-Diurnal Tidal Transitions. J. Atmos. Ocean. Technol., 21(1), 95-104.